As a teacher learning along with my students, I met Donna Williams, watershed wizard at the Massachusetts Audubon Broad Meadow Brook Conservation Center and Wildlife Sanctuary. She told us that the word watershed means the area from which rainwater or snowmelt drains into a particular body of water. You’re always standing in a watershed, even if your feet are dry. Watersheds are often split by town or state boundaries, complicating efforts to protect them. Before the Blackstone River could be cleaned up in any significant way, the watershed of the river, draining large areas of both Rhode Island and Massachusetts, had to get over those political identities, and some economic rivalries, too, and start thinking like a watershed, an area with a lot to gain by working together. Knowing about watersheds can help us understand both the organization of ecosystems, and the impact of environmental damage–and environmental improvement. To make it even more interesting, we live in watersheds within watersheds. When my hillside gets a heavy rainfall, whatever doesn’t soak into the ground runs downhill into one of several small brooks which braid together to be called Indian Brook. So I live in the Indian Brook watershed. A couple miles downstream, Indian Brook runs up against a dam and forms the Hopkinton Reservoir, in Hopkinton State Park, which looked like this on September 18, 2013, at a time of low water and not much color yet in the leaves. After it emerges from the reservoir, Indian Brook twists and turns some before it runs into the Sudbury River, near the tracks for the MBTA train to Boston. Meandering through Ashland and Framingham, the Sudbury runs beside the Massachusetts Turnpike briefly, then heads north, through the marshes of the Great Meadows National Wildlife Refuge. In Concord, the Sudbury joins up with the Assabet River at a place called Egg Rock, to become—presto change-o—the Concord River. 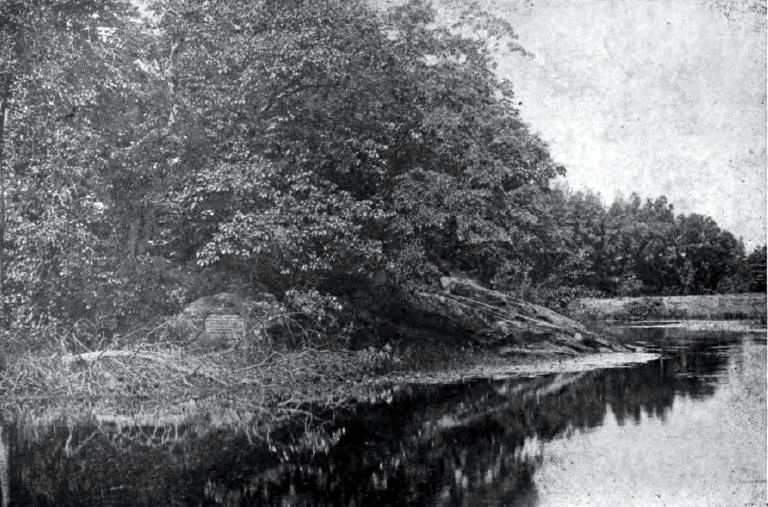 This photo of Egg Rock was taken in 1904 by Alfred Sereno Hudson [Public domain, via Wikimedia Commons] from the very beginning of the Concord River, with the Assabet to the right, and the Sudbury out of sight to the left. By the time it gets to the Concord River, my backyard runoff is traveling with that of many of my past students, from Hopkinton and Southborugh and also from Westborough, Marlborough, Northborough, Sudbury, and Wayland. The story isn’t over, though, until we get to the ocean. In Lowell, the Concord joins the Merrimack River, saying hello to a tremendous share of the runoff water from New Hampshire and central Massachusetts. Go check on Wikipedia: http://en.wikipedia.org/wiki/Merrimack_River, and you’ll see what I mean, unless someone takes the map down. 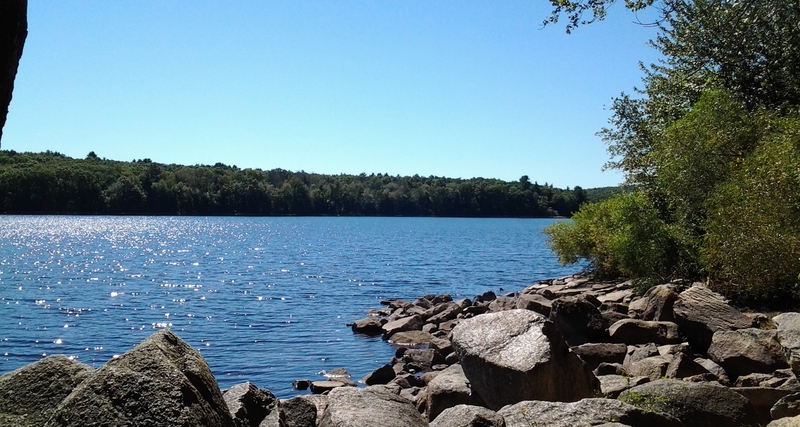 Hundreds of thousands of people live with me in the Merrimack watershed. Of course, for a humbling comparison, you could check out how much of North America is drained by the Mississippi. Anyway, back to New England, all these waters head for Newburyport and the Atlantic, shouting for glory as they go, especially in flood season. Many explorations opened up this story for me: walking parts of my watershed pathway, canoeing other parts—swimming in some places!—and tracing all of it on maps. Like so many explorations in my life, this one started with something a student wanted to do. For a big individual report, David Gelman wanted to ‟chase” his own watershed pathway. Here’s something interesting: although David and his family lived only a couple of miles from me, his pathway was completely different, and led to the Atlantic via Narragansett Bay in Rhode Island. 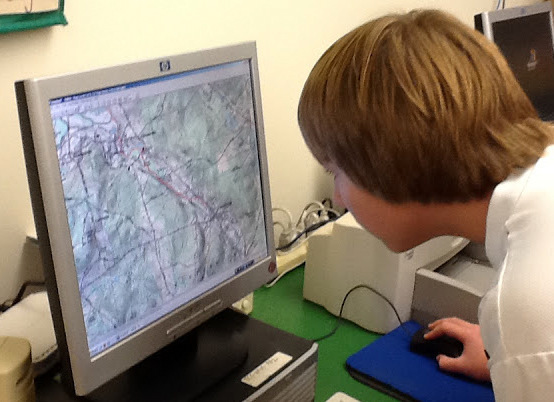 While everyone else was reading books, David and I sprawled on the floor to read topographic maps. Step by step we figured out which body of water led to which, using the topographic contour lines to make sure we were headed steadily downhill, the way water does. 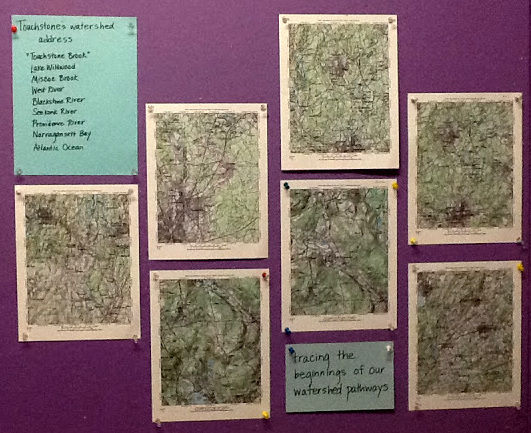 At the same time, we figured out all the places where roads followed, or where bridges crossed, the succession of brooks and ponds that led David’s backyard runoff to the Mill River and then the Blackstone River. Armed with that information, David and yet another amazing Touchstone parent, his mother Rosemary, went adventuring, ‟chasing the river.” They managed to find almost every road crossing of their watershed pathway. At each stop they did simple visual tests for water quality, and took photographs. Their thoroughness was inspiring to everyone else, and deeply satisfying for them. David wound up knowing something about his place in the world that I wanted more kids to have a chance to know–and more grown-ups, for that matter, beginning with myself. This stream of thought (I couldn’t resist) could go on for quite a while–It would take much more than one blogpost to tell about everywhere that led. Think of your power, David, wherever you are! Next time, finally, I’ll jump forward to the 2012-2013 year, when we were studying New England, and did some work with watersheds using Topo software. Down by the virtual riverside.